So, the world has spit Israel from its midst, surrounded her with a naval and air blockade, has already shot down two aircraft for entering Israeli air space and detained hundreds from attempting to enter via the Mediterranean and there are no numbers telling the outcomes of any who attempted entry traveling through Arab lands, but it is assumed they did not fare well. At this point in time, there are still over a million Jews in Europe and over three million, possibly four million, Jews in the United States. Were they to face rising levels of animosity both from numerous groups who have rid the world of the scourge of Israel and those who have now set their sights on the remainder of the Jews, where would they find safe refuge. When this is brought up, we hear a lot about the rule of law, human rights and the protections granted by Constitutions and legal principles. Where these arguments fall flat is when one simply looks back at the 1920’s and early 1930’s. Seeking the most advanced, politically free, most private rights protections, highly civilized, leader in physics, mathematics, chemistry, power generation, literature, music and virtually every other human endeavor all eyes turned to Germany. Germany was where scientists went to advance their careers and learn from the greatest minds on the planet. Remember that Albert Einstein still resided in Germany during this period as did most of the other top physicists of this era such as Heisenberg, Edward Teller, James Franck, Wernher von Braun, Niels Bohr, and many numerous others were in Germany making it the center of the world of physics amongst numerous other fields. So, such a purging has occurred in modern times and if one looks throughout human history, the Jews have been purged from nation after nation with some qualifying for that dubious honor more than once. So, it is not as if such is without precedent. (The refugees, (Jews)) were welcomed nowhere and could be assimilated nowhere. Once they had left their homeland they remained homeless, once they had left their state they remained stateless; once they had been deprived of their human rights they were rightless, the scum of the earth. –Hannah Arendt, The Origins of Totalitarianism (Harcourt, Brace, Jovanovich, 1973), 267. Now that we have basically established that it can happen here because it already happened here, let us continue with our little imaginary escapade. With no other nation on earth outside a select few who also took in Jews during the Holocaust and one even denied their Nazi allies when ordered to either murder their Jews or turn them over to the German SS Officer to return them to Germany and put them where they belonged, which of course was Japan, who along with China and the Philippines allowed Jewish refugees harbor. These nations could not give refuge to close to four million refugees without causing unrest in their own cities. Realistically, should the world decide that Israel is the pariah amongst the nations and that the Jews are the contamination which causes such, the only refuge Jews would have available would be Israel. Perhaps the world would be kind and allow the Jewish refugees from the rest of the world to be permitted a one-time allowance to enter Israel. Such a “kindness” would likely be a limited time affair where they would be permitted at most one month and likely less to make port and live in Israel. This would be welcomed by Israel as she would likely be demanding to be permitted to give refuge. This was proven during the crisis over the Vietnamese Boat People as from 1977 to 1979 the State of Israel permitted approximately 360 Vietnamese boat people fleeing the 1975 Communist takeover of Vietnam to enter the country. Israel has always been more helpful taking people with real emergency situations into Israel from the Syrian civil war and taking care of their immediate needs. Can anybody claim that were the situation reversed that Israelis would be treated in Syria? This is the reality which was evidenced when the Arab world expelled almost one-million Jews with most expelled between 1948 and 1960. The majority were taken in by the young state of Israel despite hardships, difficulties and challenges this caused. Israel did not have sufficient housing and some refugees had to initially be housed with families in Israel who stepped forward and assisted their brothers and sisters. This also is why Israeli statistics today we find that approximately half of the population originated from the Arab world. The idea that the Jews could simply return to Europe if Israel disappeared is as false as any premise could be. These Arab nations would most certainly not permit a single Jew to return and the Europeans would not be much more willing. What we witness today across one third of the world and another third of the world not far behind does not bode well for the future for Jews in the world outside of Israel. This is a reality which the Jews will need to face and unfortunately it will be sooner rather than later. 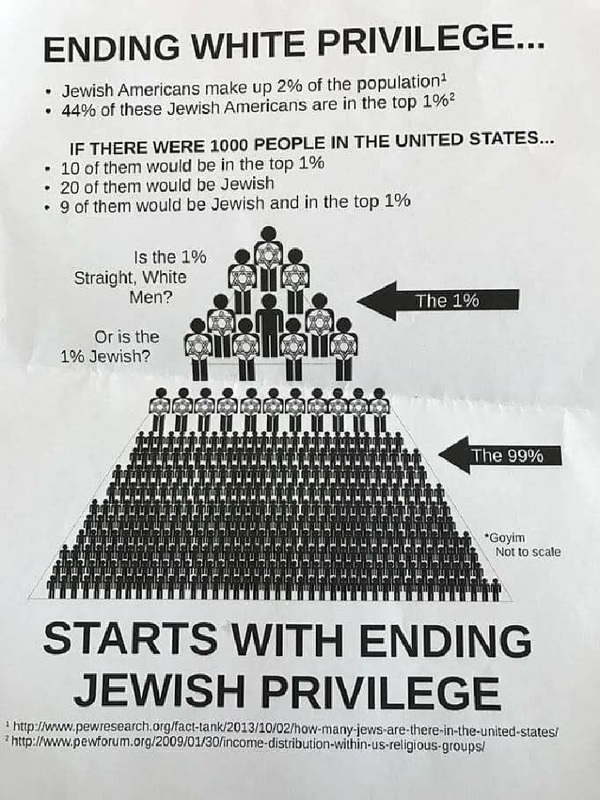 This is true even in the United States as evidenced in this poster which was distributed on the campus of the University of Illinois at Chicago. This is a sign of traditional Jew hatred and such has become endemic on numerous campuses in the United States and across Europe. All the signs are evident for one who is capable of reading the direction politics, life, public opinion and the general mood is headed, and I have been watching and warning Jews since the late 1960’s receiving numerous rebuffs and worse. Perhaps, if my protestations caused a small number to sit up and notice, then I had a positive effect. Those who claim that the Jews would never face such a scenario, especially where they reside, are simply ignoring history. History has shown that the “other” is always eventually persecuted, ostracized, ghettoized, exterminated, castigated and eventually expelled. This has not been true of only the Jews, but as one of the oldest peoples remaining as an identifiable people, and as one spread throughout the world, we seem to hold the record for such treatment. The Jews throughout history have said the same thing over and over only to end up proven completely wrong, and that is the infamous phrase, “It can’t happen here.” They thought this initially in Egypt, in ancient Persia, in Hellenistic Greece, in pre-Inquisition Spain (Andalusia), in France, Britain, Russia, Germany, Poland and on and on wherever they were to be found. The story is always the same. The Jews arrive and work at trades or take any employment which they can find. Soon the Jews are sending their children to schools using every penny they have ever saved. The Jews with education rise and become respectable. The Jews are finally accepted and this continues for a period of time. Then there would begin some anti-Semitism which spreads slowly like a virus which had a long incubation period. Eventually, the anti-Semitism hits a crucial tipping point and from that time on things start to go awry for the Jews. Initially they no longer receive promotions and their employment reviews head south. Things snowball from there and soon the Jews are being rounded-up for deportation or worse. This is why Israel is vital to the Jewish People. For twenty-five-hundred-years the Jews had nowhere they could go to escape being left to the will of strange people who often were not all that enamored with the Jews and their strange practices and their Hashem who was outside of their reality. Even when those under whom the Jews lived claimed they worshipped the same source, they still decided that the Jews were a threat which required special treatment. These treatments varied and included but not limited to enslavement, pogroms, the Jiyza tax, Inquisitions, expulsions, wearing special marker on their clothing (originated with Muslim rulers in the Eighth Century), purges, purifications and the Holocaust. Still, many Jews living around the world will ignore the history and placate themselves believing it cannot happen here. They ignore the warning signs such as Ilhan Omar and her ilk in the United States, Jeremy Corbin in Britain and others in each nation as one tours our world. The time will come when Jews will not be considered acceptable to live anywhere outside Israel. The proof is evident in every vote taken against Israel in the United Nations General Assembly where at most a dozen nations actually vote against the measures. Some people will claim that there were twenty, thirty or even forty nations who abstained, that simply means they are in the process of condemning Israel once the United States joins those condemning the Jewish State. The United States joining those who condemn Israel or at the very least no longer provide Israel protection in the Security Council, then we will see who remains with Israel. Fortunately for many nations, Israel does not check their United Nations voting record when they suffer a natural or other disaster and Israel rushes anywhere on the globe to assist those who allow her to do so. We talked about this in our article “Israel is the Unique Miracle Nation” where we concentrated on a few select and gave links to further information. We were even surprised by the number and various disasters which have received Israeli aid including the United States after Hurricane Katrina and Super Storm Sandy. One is left to wonder when this age where Jews are left out, will Israel still be permitted to assist people in distressed conditions due to storms, earthquakes, eruptions or any of hundreds of other problems. Somehow, we feel assured that the developments, inventions, discoveries and scientific achievements made by Israel will continue to make the world a better place, all the world need do is allow Israel to share and she will even to a hostile world. This is just how Jews are wired, we have an insatiable need to make the world better for our being able to play a part in it. As we are commanded, we are to be a light unto the nations, no qualifiers. The Palestinian Authority has begun their reaction to the presumably soon to be announce Trump “Deal of the Century.” Their fear is that any new deal might leave them on the outside peering through the window, if even that. In preparation for a worst case scenario, Riyad al-Maliki, the Palestinian Authority’s (PA) “foreign minister”, on Tuesday asked the UN Human Rights Council to take practical steps to protect the two-state solution. We have to give him credit; at least he knows where to find sympathetic receptions. He could have chosen any United Nations agency or the General Assembly and received all the promises he desires. Their promises are worthless, but they simply wanted to be told they were relevant and receive some stroking from friendly quarters. He wanted somebody to ensure justice for the Palestinian people. In that his insists that they give guarantees to the Palestinian people, whatever that actually means any longer, that they will be granted an independent Palestinian State with self-determination, something they do not have under Mahmoud Abbas, and they demand that they have their capital in Jerusalem. This they have been offered before by Israel more than once and turned it down, but they want the guarantee so they must receive the same offer again which they will refuse again. They also insist on the “right of return” for their five-million plus refugees to the very homes they were expelled from presumably resulting from the war to exterminate the Jews six Arab armies waged in 1948 upon the birth of the State of Israel. The reality is they left on the urgings of the Mufti who promised after Israel was destroyed they could share in the spoils but when they lost the war they placed those who listened to the Mufti in camps and they and their children and their children’s children and even further generations ever since. Their demands for this are based on, according to Riyad al-Maliki, UN Resolution 194. The wording is very specific about the resolution of the problem of the refugees. It mentions nothing about their receiving a state nor does it mention Jerusalem as their capital city. It does not mention the word “Palestinians” but it does stipulate that the refugees were to be permitted to return to their homes providing they would, “live at peace with their neighbours,” which has been amply proven is not the case. Every survey taken of the Palestinian refugees which the Arabs have religiously incarcerated since 1948 in contrast to the way Israel treated the Jewish refugees from the Arab world who were evicted after being stripped of all wealth and sent with the shirts on their backs and little else. These Jews, over eight-hundred-thousand, had lived in these regions often since before the birth of Islam and some since before the birth of Jesus, but they had their homes, businesses, bank accounts and any other wealth confiscated, a nice word for stolen, and sent packing and unless they held a passport to another country, European or the Americas, they had nowhere to turn other than Israel who took them in, often going to get them by sea or by air, and they were incorporated into Israeli society, not locked away in camps for generations. In the ensuing fifty-plus years, their homes and even entire villages have fallen to Israeli growth and the natural changes a nation which has taken in hundred upon hundreds of thousands of Jews from around the world, many refugees, as noted above, were sent out impoverished by the Arab world spanning all of MENA* while others simply returned out of a desire to return to their ancient homelands. Had the world actually desired for Israel to succeed and survive, they would have treated the situation just as similar situations have been handled, by enacting a population transfer with the Jews going to Israel, over eight-hundred-million as refugees from the Arab world and over half a million who were refugees from Europe after World War II all added to the indigenous Jews who often could trace their genealogy back to King David while the Arabs were to be permitted to return to their nations of origin, be it Iraq, Syria, Saudi Arabia, Egypt and numerous other places from around the Arab world where these individuals from out of where they were recent immigrants. 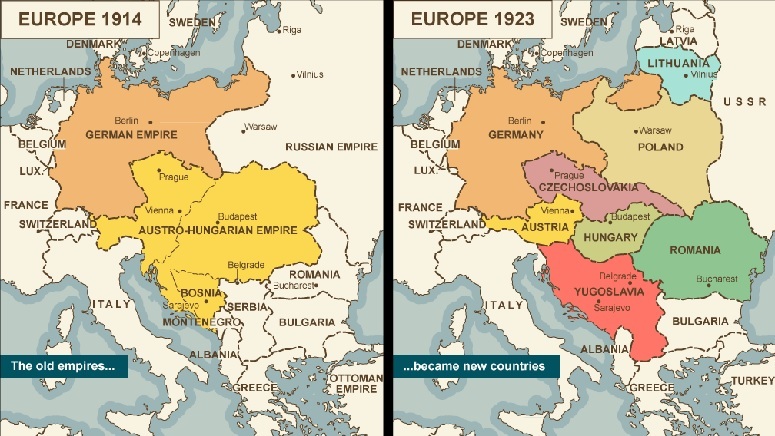 This was the solution used in Europe between numerous nations after World War II such as what occurred between Germany and Poland, as was done in Cyprus between the Greek people and the Turkish population, also the great migrations of Muslims to Pakistan and Hindus and Buddhists into India. Population transfers have occurred in every situation where two incompatible peoples were required to exchange populations to avert violence and other potential problems. In this case the problem was the Jews would have been exterminated by the Arab world if not expelled and in Europe many Jews no longer had homes to return to as they had been destroyed by the war or given to other people after the Jews were shipped to the concentration camps. In too many instances, if a Jew in Europe returned to their home town from before the war they were murdered rather than being allowed their homes and businesses being returned, their hometowns had assumed they were rid of them and had no need and did not wish to take responsibility for these now alien Jews. So, Israel took all the Jews the world did not want, Israel is not going to take in Arabs who have been steeped in anti-Semitism for half a century and bred to want the Jews of Israel dead. After all, there is that phrase in the resolution which goes, “wishing to return to their homes and live at peace with their neighbours.” The Arabs are not desirous of living at peace with their neighbors in Israel, they desire killing their neighbors in Israel. Of course, we could argue the legal obligation to the Jewish People from signed treaties, conferences and even Article 80 of the United Nations Charter which obligates their enforcement of the Mandate Systems set up by the League of Nations, until we were all blue in the face and it makes no difference as the world refuses to enforce these obligations and instead works tirelessly towards the destruction of Israel as the home of the Jewish People and the Jewish State. Israelis largely are not so foolish as to expect the world to treat them fairly or to live up to their obligations. They are largely aware that the Europeans look at the formation of Israel as an error they made while not necessarily in their right minds and are working to undermine the Jews at every opportunity, well, most of them at least. Too many Israelis actually expect that the United States is and will forever remain their friend. We wish this were so but with the recent remarks by the newly elected Congress people, Ilhan Omar, Rashida Tlaib, and Alexandria Ocasio-Cortez, the future may not be the sunny and bright bipartisan support with which Israel has grown accustomed. 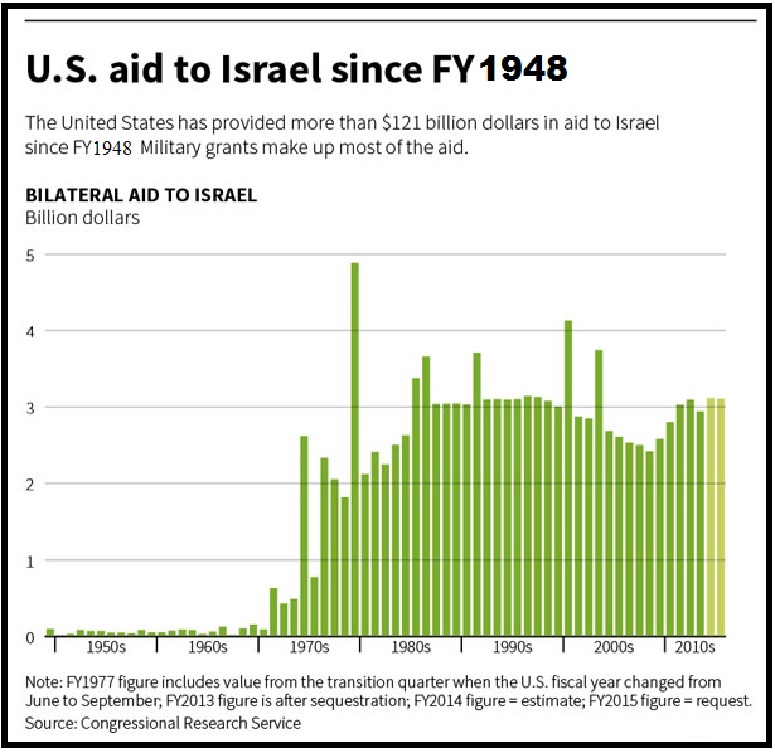 What many Israelis do not remember is that the United States did not fully support Israel in the manner they believe until after the Six Day War and actually starting in the early 1970s (below is the graph of aid to Israel by year from the United States). The claim has been to depict an ever-increasing amount of aid but the actual aid leveled off quickly and remained at the same level until the present. But this is a problem which needs to be faced in the future with the only variable being how far into the future. The current problem is more with the European Union and member nations along with every conceivable arm of the United Nations outside the world court system where laws actually mean something, as even an Egyptian Jurist tried to warn the Palestinian Authority. One of the main goals stated by Mahmoud Abbas has been to “internationalize” the Arab-Israeli conflict. This was part of his new, but previously demanded, terms for moving forward with the peace talks adding it must be based upon the Arab peace plan. His demand for an international forum to decide the fate of Israel centers around his insistence that the forum be based on the United Nations General Assembly. A better way of putting this is that Abbas desires a group which will vote 109 to 12 with 56 abstentions in favor of anything the Arabs propose and against anything favoring Israel. By internationalizing the peace process, he wants to assure that he gets his own little kingdom and that Israel receives five to six million new citizens who must be granted full rights so they can elect whatever Arab leadership they desire at the next election. Another way of stating this is; Mahmoud Abbas wants his own nation and to destroy Israel too. Of course the European Union thinks this idea is just ducky, the United Nations would love nothing better than to decide the fate of Israel in the General Assembly, much of the dictatorships in the world are behind this internationalization of the Israel question, the Arab world thinks this would be fabulous, and apparently only a couple of dozen nations protest this as totally unfair to Israel. All that matters is Israel will not participate in her own lynching by the merry band of thugs Abbas seeks to bolster his side. Israel has sought peace since her founding in 1948 with David ben Gurion. 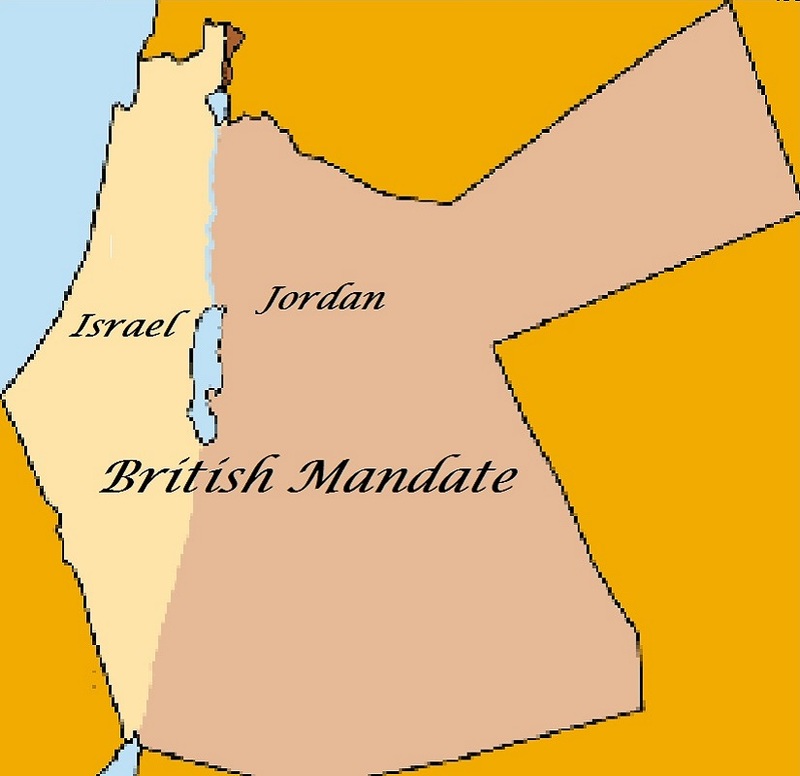 The recent revisionist history has the Israeli leadership voting not to be bound by the patrician map approved by the United Nations General Assembly in Resolution 181 passed on November 29, 1947. This makes no sense as the Arab League had already rejected the patrician plan and all of Resolution 181 because they were on the verge of their great war of annihilation of the Jews and their newborn state. They only began screaming from the rooftop that Resolution 181 must be enacted just as the United Nations General Assembly had passed after they lost again in the Six Day War of 1967. This failure and loss of the lands they had illegally occupied since 1949 sent them raking through historical decisions seeking one to their liking. Unfortunately for the Arab League, the one they chose was the one which was negated and forever placed into the trash bin of history as soon as they had rejected it in the first place. The thing about United Nations General Assembly resolutions is that they are advisory and as such, both parties have to agree to abide by the suggestion, the crucial word is “suggestion or advisory.” When the Arab League voted to reject Resolution 181, it became null and void and thus could not be applied later. It was a one-time offer and it was refused that one time by the Arab League. For the record, the Zionist Congress had accepted the repartitioning of their land as the Jews simply wanted a state and peace with her neighbors. At that point, size did not matter. Now that it is obvious that the neighbors will eradicate Israel at their earliest possible convenience, now size matters. Even so, Israel has made numerous offers to reach a peaceful settlement which would end the violence and terrorism. It is painfully obvious that there can be no such settlement as the Arabs, as they stated in the Khartoum Resolution with what is known as the “Three No’s”; “No peace with Israel, No recognition of Israel, and No negotiations with Israel,” which can be translated into a single no, no Israel. Any peace plan or offer which results in the continuation of Israel not under Arab rule and allowing the Jewish State to remain is a peace proposal which is dead on arrival as no Arab would ever accept such a proposal, and that is what is at the center of why President Trump has not been able to release his “Deal of the Century,” he cannot get any Arab nation to sign on and accept any deal leaving Israel intact. President Trump looked originally, we believe, at the Palestinian-Israeli conflict as a real estate problem and since he is, at least in his own mind, the world’s greatest real estate negotiator, he would walk in and find that magic combination and everybody would be popping champagne corks and celebrating. He has, hopefully, since seen the error of his hypothesis. This is not about land at all; it is about the supremacy of Islam over the Judaism they relegated as a dead faith superseded by the teachings of Mohammad. As the Jews also refused to accept Mohammad as the true messenger, they have also been deemed to have to represent the devil and as such are accursed. This makes the Jews inferior to the Muslims and as such must never be permitted to rule, especially over an area of land which once was under Islamic rule as once Islamic, must always be Islamic. Israel is thus not just a problem but an insult and provocation against the inviolability of Islam and thus must be completely and utterly subdued. That is the right way of the world according to Islam and as such must be accepted by all of the world, simply because Islam is supreme over all things. This is about religions and has nothing to do with land. The stressing of Jerusalem is over the capital of Israel, historic and anew, and must not be permitted to remain in Jewish hands. Jerusalem is not the first or even the original third holiest cities of Islam. Damascus was amongst the first as it was a capital of an enemy of Islam which they deemed to be the next one they would conquer. The city holding that title the longest was Constantinople, as it had some of the strongest walls in the world. Other cities given this title include Rome, Paris, London and whatever city is considered to be next in the crosshairs of Islam. Also, the third most holy city to Islam also depends upon whom you are asking as different groups of Muslims have different targets they seek to “conquer” as it depends on where they reside as to what is their biggest prize. It has changed throughout history and at one time, it was Vienna as the Islamic forces were stymied twice at their attempts to conquer this city. Things take on a different aspects and one’s view can become much clearer when the history and all the particulars are exposed, and Islam has to conquer the world and impose Islam as the predominant, actually only, faith and Allah the sole god for all of the earth otherwise the Quran claiming that the world would fall to Islam is in error. There is a way for the practitioners of Islam to alleviate the pressures of accomplishing the teachings of the Quran without world conquest, they simply need to choose the Meccan verses as predominant and the Medina verses as the lesser verses and void if they conflict with the Meccan verses. For an introduction to the differences and the reasons and purposes of these two separately written sets of verses, we have an introductory article with numerous links to other sources including some to a chronological version of the Quran as the actual Quran is not in chronological order, they arrange the verses from smallest to longest for easy memorization starting early in life. Meanwhile, we await this “Deal of the Century” and it will be just what the doctor ordered. *MENA = Middle East and North Africa also called the Arab world.